Photo © Copyright Kenneth Yarham and licensed for reuse under this Creative Commons Licence. 10 miles, 16km, level, largely firm under foot. The eastern half of the walk should not be attempted if there are flood warnings for the Thames. A unique walk full of surprises, mainly along the banks of the Thames. Pedants should note that the start point is historically part of Essex, although it has been legally in London for some years. This is a walk of two halves. The first has been carefully way-marked and surfaced by local councils, with interpretive signs at regular intervals. The second half is a lot less developed but in many ways more exciting. Start Rainham railway station. Finish Grays railway station. Alternative start or finish at Purfleet railway station. Trains call at Rainham, Grays and Purfleet on one of the lines between London Fenchurch Street and Southend. Explorer series number 162. Landranger 177. Note that the walk uses paths that have recently been created and may not be shown on maps. The Landranger map does not really have enough detail to navigate this route. Pubs and shops in Rainham village, Café at RSPB reserve in Purfleet. The Royal Hotel in Purfleet (also does accommodation) Pubs, cafes and shops in Grays, including the Wharf which is en route just before the town centre. The pubs on the route are reviewed on the “Beer in the Evening” and get mixed reviews, often strongly for or against. You might want to look at them before deciding which to visit. (A)Before starting out you may want to visit Rainham centre for Rainham Hall which was renovated by the National Trust in 2013 and St Helen’s and St Giles’ church To visit the village from the station turn left out of the station and then left again. (1)The walk starts from Rainham Station. If you are arriving from the London direction you must cross the level crossing to the east of the station. Immediately to the south you will see a wooden wall which conceals the High Speed 1 railway line. Take the footbridge and ramp over this line. Once you have crossed the railway line you will see a long straight ramp down in front of you. Walk down this and continue on the footpath and cycleway that carries straight on across Rainham Marshes parallel to the road. (Keep an eye out in ditches for Water Voles. Rainham Marshes are one of their main habitats) This route is signed as national cycle route 13. We will follow this route to Purfleet. Come to two roundabouts under the A13 and follow route 13 round them. After the second roundabout you come to a junction. A path leads off to the right, but we follow route 13 across the wild marshes. Reach a mound and follow the path round to the right. Come to a road and cross it. Turn left and then right along a paved lane. (2)Arrive at the River Thames. Turn left to a car park and then right towards the river. Then follow the path to the left along the riverside. (B)Notice the concrete barges. They were built in the second world war. There are various stories about their purpose. One says they were designed to carry fuel. Another says that they were used to make part of a floating harbour for the D-day landings. They were later abandoned here. The route continues to Coldharbour Point and its lighthouse. You are over 100 years too late to get the ferry which used to run across the river to Erith. Turn round the point and continue by the river. 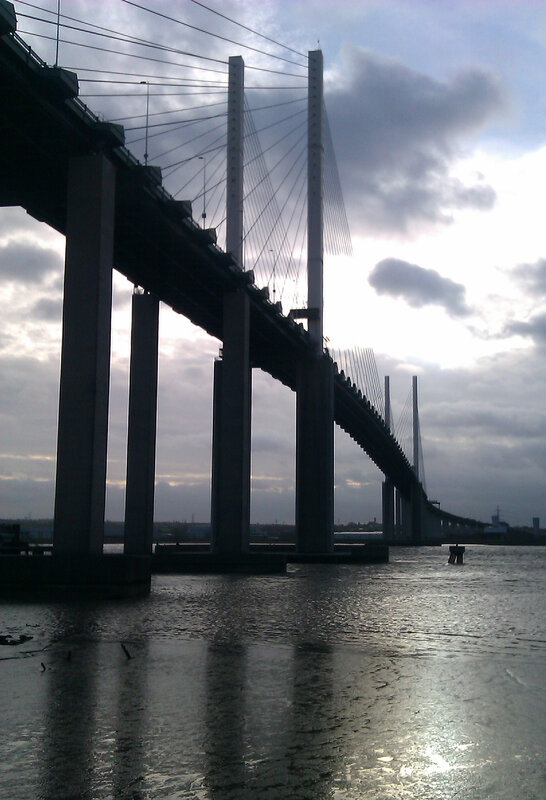 There are fine views of the river and the Dartford Bridge. On your left hand side is the remains of the large landfill site, now mainly grassed over. The path runs parallel to a service road. There is a path to theft but we do not take this. (C) The reserve was created out of the old Purfleet Rifle Ranges. Considerable work had to be undertaken to create it, including the removal of lots of old explosive shells. You can see the visitor centre, which was designed to be ecologically sustainable and vandal proof. Notice the cone-like structures in the roof which were designed to enable the birds to observe the humans in the café below, without them being noticed. There is a café with fine views of the Thames and the reserve and public toilets (open during opening hours). You can walk round the site (admission fee) The reserve web site gives details of current activities and details of what you might see in the area. (3)When you have finished at the reserve continue east across a bridge and then turn right towards the river, with new housing on your left. The route bears to the left. (D). On your left you will see an old gunpowder store, currently used as the Purfleet Heritage Museum. It is open on Thursdays, Sundays and Bank Holiday Mondays. There were once five of these buildings. The museum is mainly concerned with military history rather than other history in the area. After the museum the route enters a landscaped area. Instead of keeping by the riverside head to the left of a large building in front of you towards a road. We will continue southeast down this road. (E). The large building which is now on your right is the Royal Hotel. It may well have been here that Dracula was conceived. Bram Stoker’s novel, Dracula was published in 1897. In it Jonathan Harker, a solicitor’s clerk, arrange a house sale in Purfleet for his client Dracula, and a lot of the middle of the novel features the town. According to Thurrock council’s web site Victorian Purfleet was a tourist attraction “Wingrove’s Hotel at Purfleet, on the Thames waterfront, offered bathing facilities and amongst a wide range of gastronomic offerings were special whitebait suppers, entertainments and accommodation for overnight stays. Nearby were scenic walks along paths cut through overgrown chalk quarries, with cliff faces and ledges leading up to Beacon Hill, with its panoramic views up and down the river”. Even the Prince of Wales visited. After his visit Wingroves was re-named the Royal Hotel. Stoker was involved in theatre in London and it seems very likely that he took an excursion to Purfleet, perhaps dreaming up part of the story of Dracula whilst taking his ease in the Royal Hotel. There has been speculation about where Dracula’s house, which was called Carfax, might have been situated, but it seems likely that it was not modelled on any one place although the description of Purfleet strongly suggests that Stoker was familiar with it. However there was one large house, Purfleet House, on a site now occupied by St Stephen’s church, just north of the hotel. According to Wikepedia In March 1916, in the first world war, anti-aircraft gunners based at Purfleet shot down the German Zeppelin LZ15 – a first successful attack on an enemy aircraft in Britain. (4)To continue the walk to Grays turn right immediately before the level crossing. Follow a footpath sign pointing sharply right, almost back the way you came. You pass a small terrace of houses. Turn left at a gap between the houses. Straight ahead you will see a gate in the metal fence. Walk straight ahead tthrough this. The route meets a track. You can either turn left here, or walk ahead to the river wall (more pleasant) and then turn left along the path by the river defences. The track joins the path by the flood defences after about 500 metres. (Note that the buildings shown on some maps here no longer exist. However new ones may replace them). For the next three kilometres it is impossible to get lost. 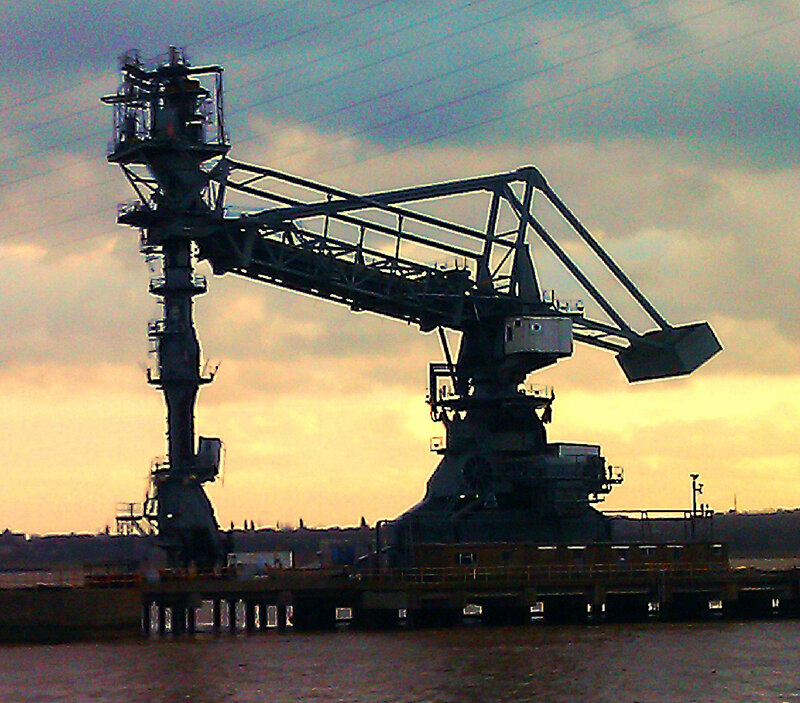 We walk through dramatic industrial scenery, with the Thames often hidden behind the flood defences. How the companies that border the path must hate that there is a right of way here. It often appears that there is no way onwards, but the path continues around obstacles, over bridges, up steps and down again, and at one point through a short tunnel. (F). Above you looms the majestic Dartford river bridge, one of the great sights of the walk. About 500 metres after the bridge the flood defences turn right and the path opens out into a grassy area. Although there are tracks in the grass to the left continue along the concrete and go up a ramp alongside the defences and down on the river side. Continue along the riverside of the flood defences until Grays. (G). You come to an amazing exhibition of graffiti art, some of it apparently inspired by Dracula and the bird reserve. Each artist has carefully taken a stretch of wall and painted on it. Unfortunately some people off less talent have over-painted some parts with meaningless tags, but the bulk of the art remains. 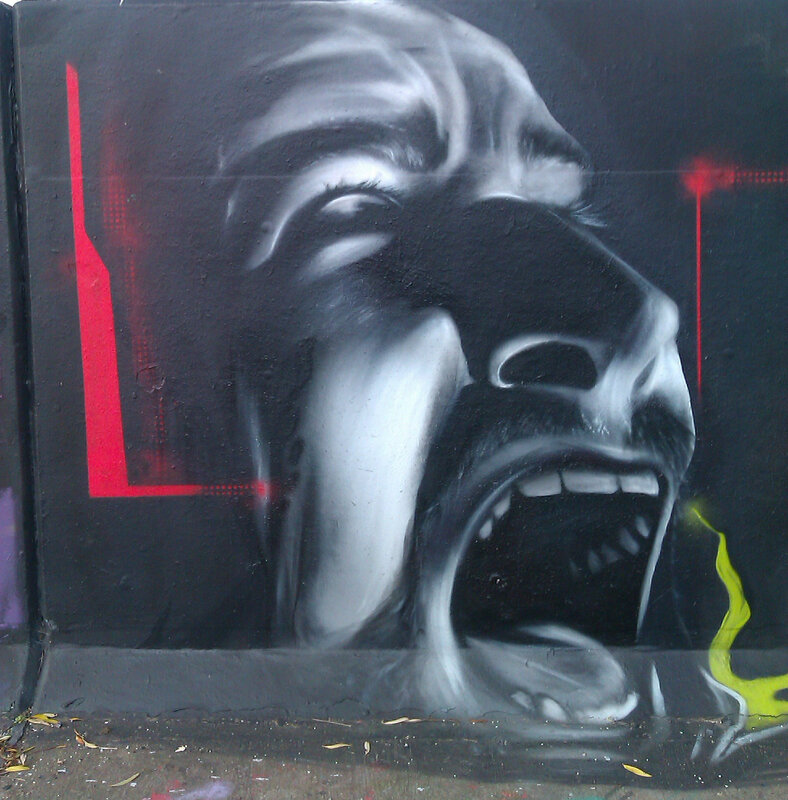 This must be one of the largest collections of graffiti art in the London area. Much of it is to a very high standard. It changes frequently, so you may not see the pictures on this page. After passing under a jetty you come to a footpath sign, on the top of the flood defences. However you keep to the river side, below the defence. 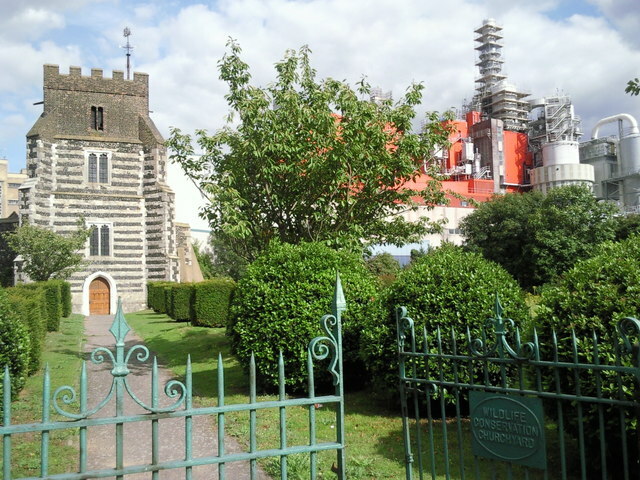 However you can divert along the footpath on the left for a few metres to visit St Clement’s church, a grade one listed church which was used for the outside scenes in the funeral in the film “Four Weddings and a Funeral”. The church pre-dates the Norman conquest. More dramatic industrial scenery follows. The path suddenly turns left inland and then right and right again to regain the Thames. Continue east along the Thames. Past a service road and care park. Someone seems to have plonked down a modern house or office at the end of the road, complete with a Derek Jarman style seaside garden and metres and metres of decking. In 2013 the development was unoccupied. Just after this the path turns left and reaches the outskirts of Grays. Turn right here along the promenade beside the Thames. We now re-join cycle route 13. Keep walking west in a straight line following the cycle route. (You can walk to the right along landscaped former wharves, but you will have to return later to the original line. Who designed this landscaping and why? It must have looked good on paper, but when we were there no one was using it. On the left are characterless blocks of flats. (I)It is a relief to come to the Wharf pub. Continue straight ahead past this. Bear right at a junction, following the cycle path. Then come to a large inlet (a former wharf) where you must turn left. Turn right at the end of the wharf. This wharf dates from medieval times and has recently been refurbished. Do not turn right again at the next corner of the wharf but keep straight on along Columbia Wharf Road. Where this turns left keep straight ahead on the pavement to join Argent Street. Come to the White Hart pub on your left. Turn left here on a footway. Pass the college The footway turns into a shopping street and passes the church. Immediately after the church turn left to reach the end of the walk at Grays station.